I am an avid iPhone fan, but I admit I really use it for texting, Facebook, email and and following my RSS reader. However, I will not be upgrading to iOS 6 any time soon. Why you ask? It’s all because of the new Apple maps. 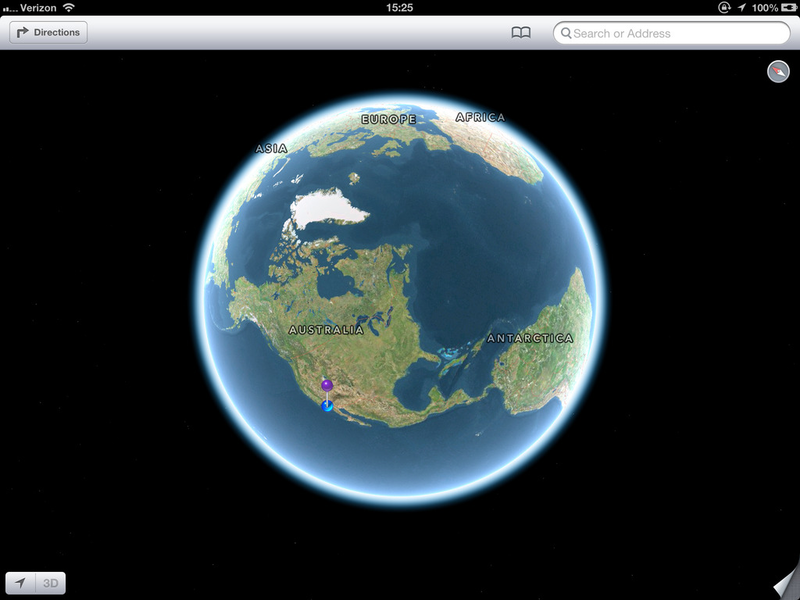 Photo from Tumblr iOS 6 mistake with Australia showing up in the USA. Let us just say I work with a bunch of map geeks and I know what it takes to get a map right and Apple did not take enough time or clearly think out their strategy. Creating a global geographic information system (GIS) is no easy task and should not be taken lightly. Google has years of practice. I’ll be sticking with them a little while longer. For those who upgraded, just go to maps.google.com and follow the directions to add the Web app to your phone. Voila, back to Google maps. I can completely understand Apple wanting to get into their own maps business as the key to everything these days is the data. Recently there was an article in The Verge about Google. This article showed that they were focusing on data from the very beginning. Managing data, especially lots of it is quite challenging. Mike Dobson’s blog regarding Apple’s debacle put everything into great perspective saying they are pulling from C- grade suppliers and getting all the disparate data sources to work together is a very difficult process. I couldn’t agree more. What does this have to do with kids and families? More than anything if you decide to go ahead with Apple’s maps, make sure you and your kids understand that the accuracy of the data provided may not be correct. My son is learning about citing his sources in school and that Wikipedia is not a good source to use. It’s good in general for you to gain understanding about a particular subject, but not for all of your research. For that, you need a reputable source such as Britannica or other peer reviewed sites. Hey, not everybody gets it right the first time. It took Google about four years to get my correct home address to show up on their maps. I won’t be waiting four years to install iOS 6, but I will wait until a app comes out from Google that’s a full blown application instead of a Web app. Ars Technica: Is Apple’s new maps upsetting? Business Insider: TomTom: Don’t Blame Apple Maps Problems On Us!